This has to be one of the prettiest cross-stitch kits I have seen – it is titled Bouquet on Lace! 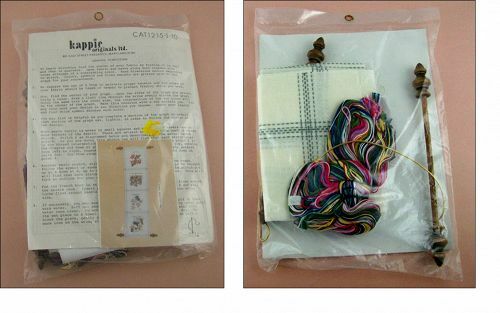 This listing has 2 vintage counted cross-stitch bookmark kits! Neither package has been opened. 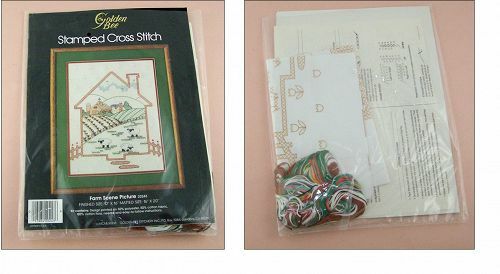 This listing has an unopened stitchery kit made by Kappie Originals Ltd. of Frederick Maryland! The kit is for a floral wall hanging that is stitched on even weave fabric. 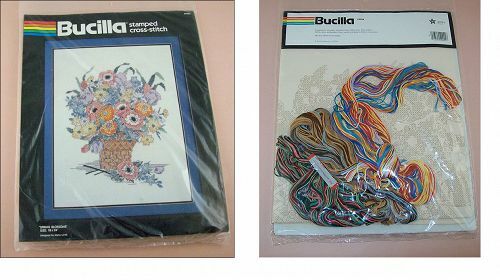 This listing has a vintage mint condition unopened Bucilla stamped cross-stitch kit that I purchased many, many years ago! The kit is titled “Spring Blossoms” and was designed by Joyce Levitt. And yet another of my “want to do, never got around to it” sewing projects! This one is a stamped cross-stitch picture titled “Farm Scene Picture”. It is designed with the appearance of a picture within a picture – a farm scene that is “seen” inside the outline of a house. Neat idea! This vintage feed sack has a lovely pattern! The feed sack is blue and has white daisies and pink roses. It measures 35” x 42” and is in excellent condition. Another unusual vintage feed sack – it’s blocks of numbers and flowers! Feed sack measures 42” x 39”. 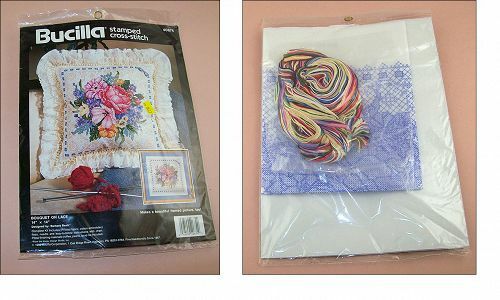 This listing has a very colorful vintage feed sack! It measures 31 ½” x 38” and is in super condition. It has a ¾” hole located 6” from edge – that’s it! Another vintage and unusual children’s theme feed sack – it’s a circus pattern with clowns, elephants, and horses! Feed sack measures 42” x 34” and is in super condition – it has 1 small thread separation. Another lovely vintage feed sack! This one has a white background and has lots of little lilac color flowers! Feed sack measures 34” x 46” and is in excellent condition. This feed sack is identical to our #M4838 except it measures 37” x 42”! Excellent condition with that new “crispy” feel! 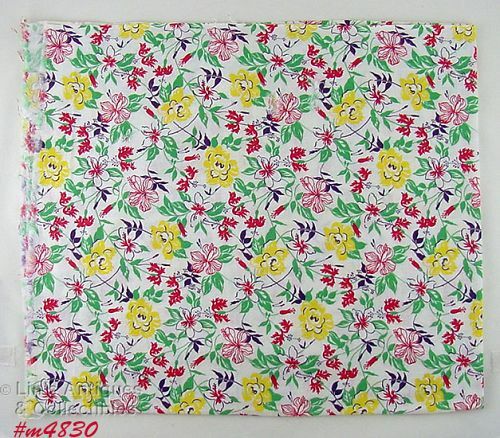 This listing has a lovely and unusual pattern feed sack – it’s a white background with green umbrellas and yellow umbrellas with outlined flowers. Feed sack measures 37” x 40” and is in excellent condition – still has that new “crispy” feel. Yet another vintage feed sack with a very unusual pattern – this one has assorted fish! Feed sack measures 37” x 40”. It is not in perfect condition – it has a 1” and a ½” split located approximately a quarter way into the fabric and it also has a 1” hole at edge. I have definitely listed some unusual feed sacks and this one is no exception! 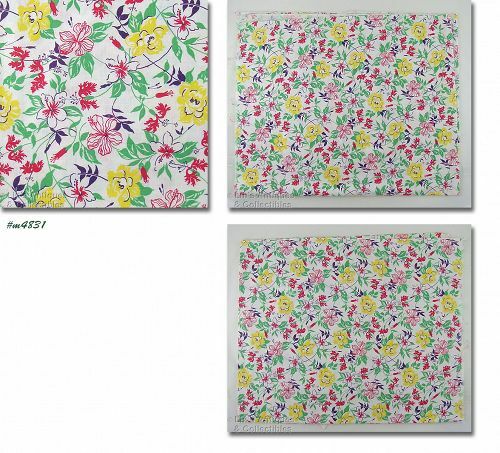 The pattern of this one is Grandmother's Flower Garden – as seen on so many hand-made quilts! Feed sack has not been fully opened. It measures 37” x 21 ½” (opened would be 37” x 43”). It is very colorful – colors are bright – and it is in excellent condition. Another children’s theme vintage feed sack – red drums on a white background! Feed sack measures 36 ½” x 42 ½”. It is not in perfect condition – has a 1” tear located 3 ¼” from edge and 1” from side. Also has a couple small dark dots and 6 rust dots. Another colorful vintage feed sack – this one is the same pattern as our #M4825! Feed sack measures 38” x 38”. It has a 1” x ¾” hole located 12” from edge, 2 holes that are ¼” and are located 3” from edge, and there is a yellow spot on edge. This feed sack is the same pattern as our #m4830 and also is not in perfect condition. Feed sack measures 37” x 42”. It has flaws/holes: one that is ¾”, two that are 1”, two that are ¼” – these are located 5” from edge. There is also a line of yellowing that is approximately 12”. Again, I do not pre-soak so this yellowing may or may not launder out, I don’t know. Gorgeous colorful flowers on this vintage feed sack! It measures 37” x 42” and while not in perfect condition, it has plenty of usable fabric. Feed sack has several flaws: there are three holes measuring 1”, one that is ¾”, two that are ¼”, and two that are ½” – all are 5” from edge. There are also some faint stains (I do not pre-soak linens so they may or may not launder out but I do not know).